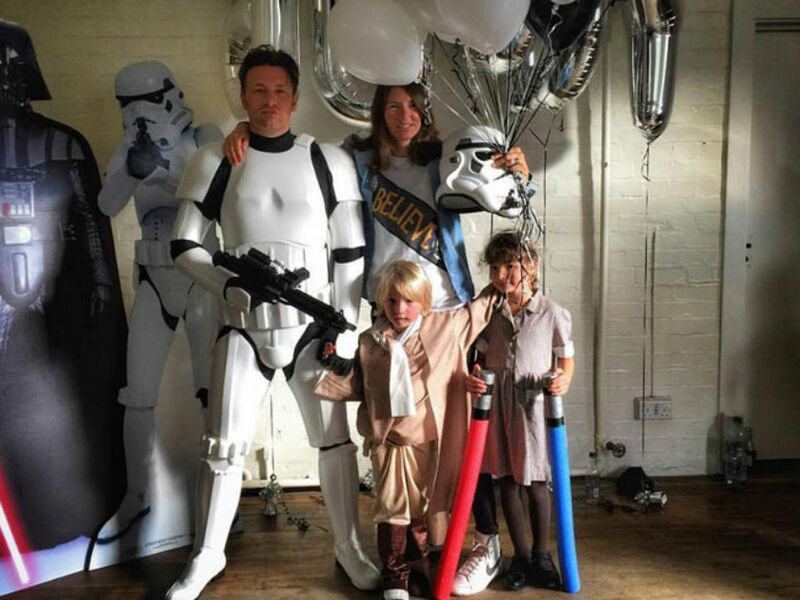 You HAVE to see Jamie Oliver dressed up in a Star Wars outfit for son Buddy’s fifth birthday! Jamie Oliver has dressed up in a Star Wars costume for his son's birthday... and you HAVE to see it! If there is anything we love in life, it’s celebrities dressing up. So you can imagine our delight on discovering Jamie Oliver dressed as a Stormtrooper of the Star Wars franchise. Now imagine that joy doubled, on realisation this exhibition of dress-up was all in the name of Jamie‘s son Buddy and his Star Wars themed fifth birthday. That’s right- we exploded into confetti. The 40-year-old dad of four took to Instagram to post a snap of the family, all donning Star Wars costumes. He captioned the photo, ‘Happy Birthday to my little Buddy Happy 5th Birthday…I jumped into his party and immediately got beaten by 20 x 6 year olds with foam light sabres!! I’m shaken but i’m ok… may the force be with you’. Jamie Oliver, dressed as a Stormtrooper, was beaten up by a bunch of kids- all of whom were sporting light sabres. We’ll just give you a moment to process that. (We like to imagine the kids shouting things like ‘we want chicken nuggets and Turkey Twizzlers’ for extra comedic value). Comments were flooded with birthday wishes for little Buddy, and also praises of Jamie and his pretty wonderful costume: ‘Brilliant. May the force be with you all today… have a great birthday Buddy’, ‘You’re the best Jamie, keep it coming’, ‘best dad ever!’. We better make the most of these hilarious children’s party themes, however, as unfortunately Jamie (who is also father to Daisy Boo, Petal Blossom and Poppy Honey) is adamant he will not give into wife Jools‘ encouragement of a fifth child. A previous interview saw Jamie explain his partner of 15 years has ’empty nest sydrome, and ‘just doesn’t want it to end…but I think it’s a great idea to end. I want date night back’. Date night can come back… but only if you promise to dress up in costume every time, Jamie!